The Peer Mentor Program is designed to help guide undergraduate students interested in pursuing research and inquiry, by providing student mentors. Undergraduate and graduate students from all disciplines will serve as Peer Mentors. 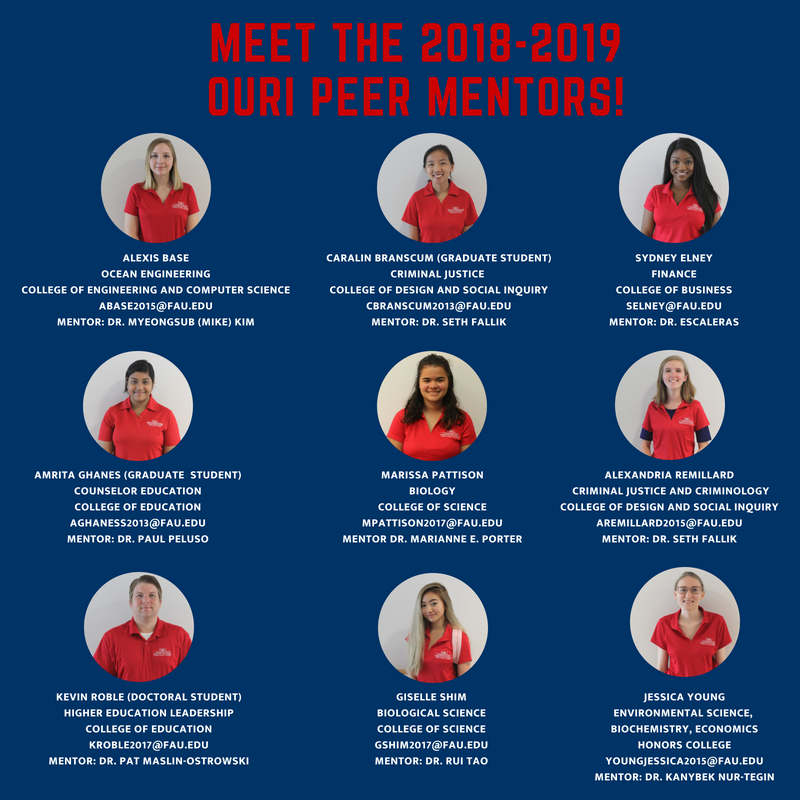 Peer Mentors are available for open mentoring hours, hosting workshops, and providing classroom presentations all to integrate and expand a culture of research, inquiry and creative activity on all of FAU’s campuses. Peer mentors work closely with the Council for Scholarship and Inquiry (CSI) to support this initiative. If you are interested in getting involved in research please contact one of our current Peer Mentors to learn more about how you can get involved! Interested in serving as a Peer Mentor? See instructions on how to apply below. Deadline to apply May 31st, 2019 by midnight. Have one semester of DIS or other documented research experiences completed before applying. Mentor undergraduate students interested in engaging in research and inquiry. “Meeting of the Minds”: a series of events co-hosted by CSI targeting different colleges to expose students to the research being conducted by faculty within the college. “How to…” series: a series of workshops developed to assist undergraduates to get involved in research and scholarly activities including ethics, developing a research question, and much more! Have completed at least on semester at FAU. Work with OURI for at least 60 hours per semester. Complete midterm and final evaluation. If you have any questions regarding this course please contact intern@fau.edu. If you would like to apply to become a Peer Mentor with the Office of Undergraduate Research and Inquiry please complete the list below and email all application materials or questions to Dr. Tracy Baker. Answer Required Eligibility Questions (under Tasks) by clicking "Start." You must agree to ALL eligibility questions before the Peer Mentor Application will show up under your programs. Find OURI programs you are eligible for (i.e. the Peer Mentor Program) by clicking "view programs." If the Peer Mentor Program application does not show up on your program list, please review your eligibility form: you must agree to ALL eligibility questions before the Peer Mentor Application will show up under your programs. **If you have any questions, or difficulty completing your online application please email Dr. Tracy Baker at tnlbaker@fau.edu. This application was adapted from the University of Central Florida's Office of Undergraduate Research.